Here is a little collection of timeline cover templates that you can access as free downloads. Hope you enjoy them! Use them as a quick little thoughtful thank you gesture for clients and/or on your pages. •2• Change colors, fonts, the position of the different layout elements (where the design permits) to meet the needs of your studio and pho- tography clients. When it comes to Miller's Design Market, folded luxe cards, mini accordions and albums might be my favorite products to design for. 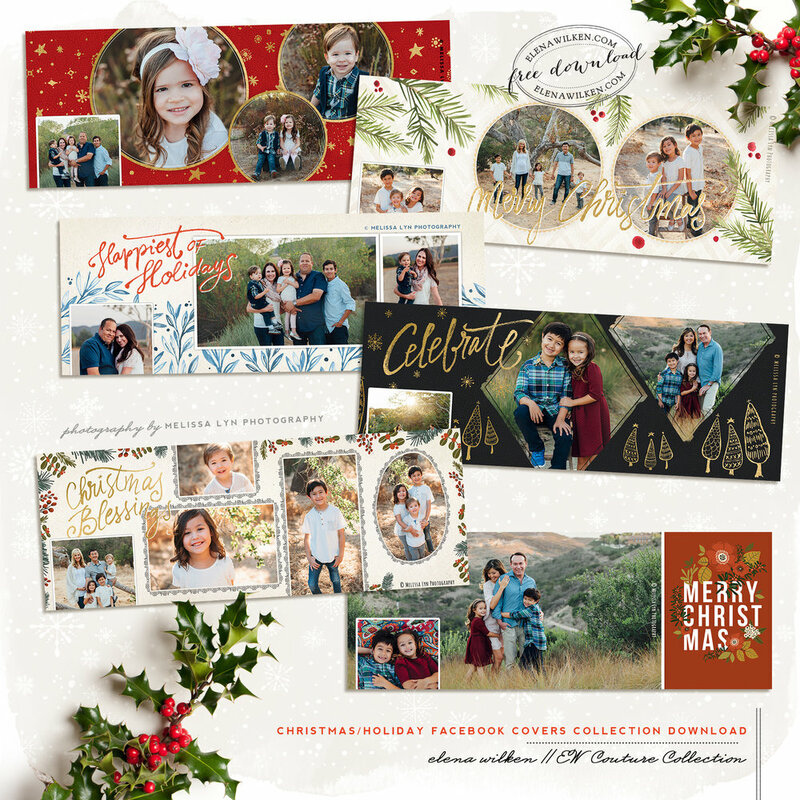 It's been fun pushing my creative boundaries while working on the Christmas 2016 collection - cards and albums alike. ...A few favorites from the many 2016 EW Couture photoshop template design additions in Miller's Lab Design Market. I am really excited and honored to be joining Miller's Lab Design Market team, while continuing to grow the list of offerings through EW Couture Collection as well! It's been an awesome start, and you can definitely expect to see a whole palette of new templates in the coming year, for the great, high quality products Miller's Lab offers. 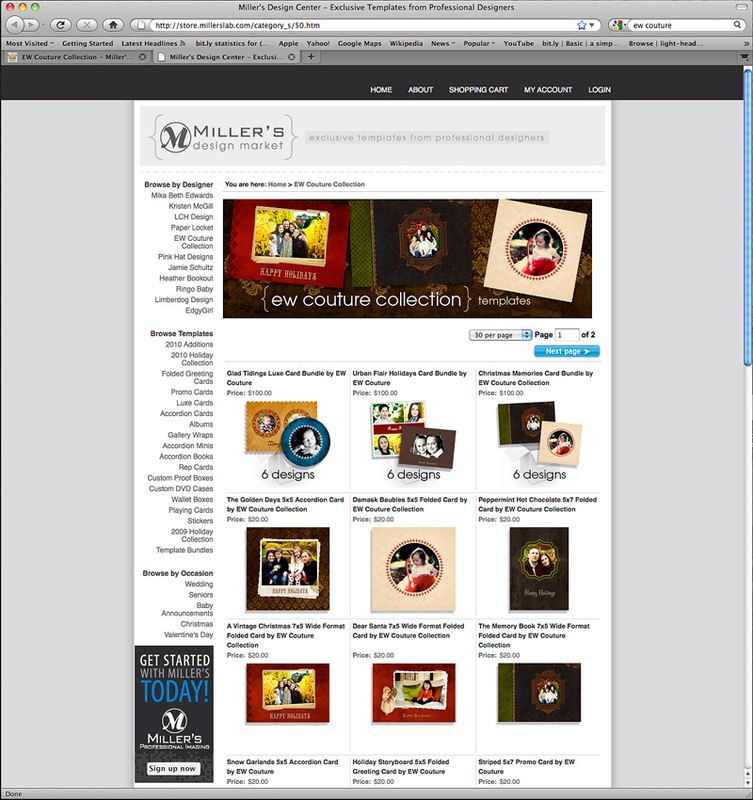 You can check out the Miller's Lab Exclusive EW Couture Line of templates by visiting Miller's Design Market, or the gallery on EW Couture Collection site. To start with, if you are a photographer and have been enjoying the downloads posted under EW Couture Collection category so far, head over to EW Couture Collection blog for a handful more, posted in the last several months. 5x7 Marketing cards, a brochure, an accordion mini album, an accordion mini album 2011 calendar, and a set of cute storyboards. Hope you enjoy them! An easy way to never miss the monthly free template downloads is to sign up for the EW Couture Collection newsletter. ...A voting thread for November's download is now in full swing on the EW Couture Collection Facebook Page. Feel free to chime in, if you would like. A 16x16 storyboard template, or a little set of MOO mini cards? Here is a preview of the free template download for July. There are two files included: a template for Miller's Lab 5x7 Proof Case (it holds 150 unmounted prints) and a template for WHCC's 5x7 Image Box (it holds 100 unmounted prints). While my color choices for these files are really strong and rich, you can change theme to fit your business identity’s color scheme or preferences, as needed. The texture layers can be turned on and off, and you can even switch out the simple rectangular clipping mask for fancier ones you might want to create for your images. To download this template, hop over to EW Couture Collection blog. 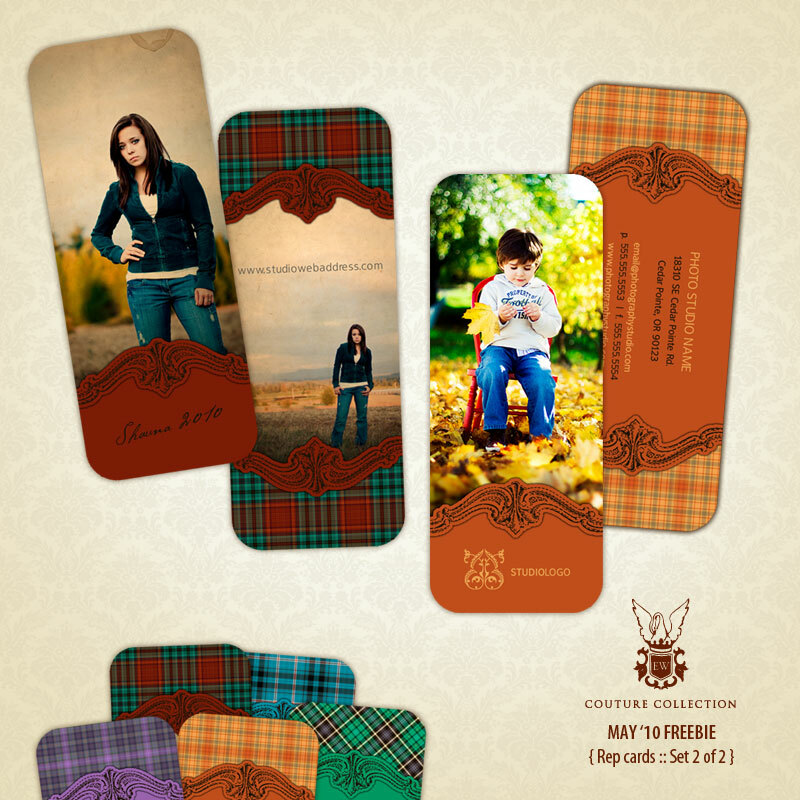 And here is May's free EW Couture Collection template download: two beautiful plaid sets of rep card templates. I first created the regular business card size rep cards and decided to add as a little bonus to this month's download the Miller's cool version of the rep cards. Their Rep Cards are a fresh, pretty sweet take on senior rep and studio business cards. I wonder which ones you'll like best. You can download them through the EW Couture Facebook page, or on the Maternal Lens (as of tomorrow). It's been a couple of weeks already since I sent out the email with April's free download from the collection of free marketing templates for photographers, just haven't found the time and blog about it. A really cute template for a wallet size accordion mini book (mini "purse size" brag book). 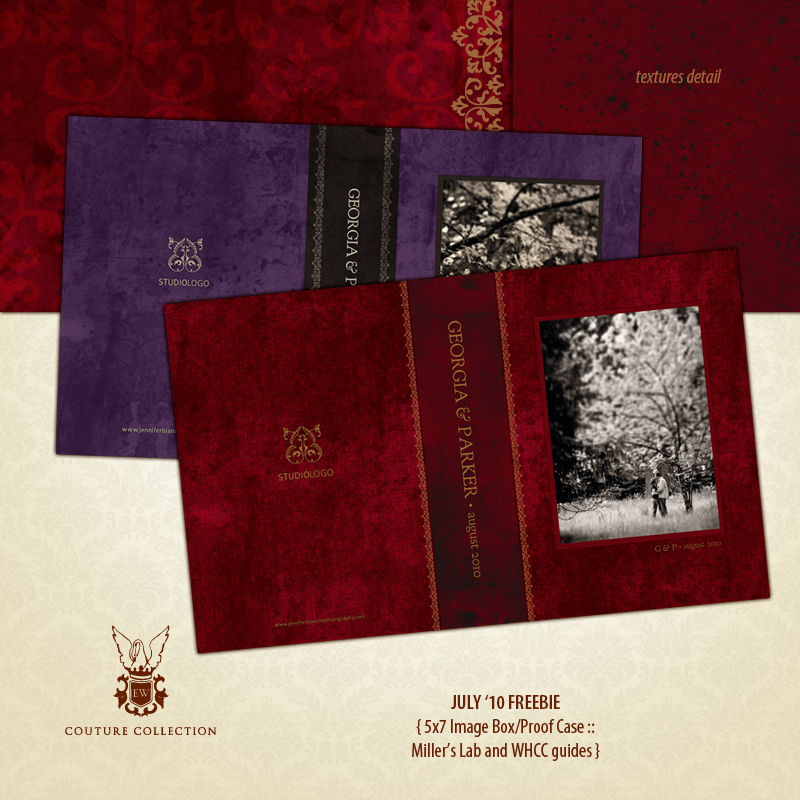 For the photographers that would like the template - you can download it on the EW Couture Collection Facebook page. Also, wanted to say thank you to Sarah Siripoke for sharing images of the cute mini album she printed using this month's download. I love the cover image. So adorable! The templates match the free marketing set made available for download in January '10. The files will also be featured and available for download on Michelle Black's website, The Photo Professional. I've been keeping extremely busy and have tried to catch up on all the time lost while being sick this last two months. But I am no super hero :) Here is to a small but beautiful beginning, to an awesome adventure in the making! There is always next month, and the month after, and the month after for releasing beautiful goodies for talented photographers, that take your business up a notch. Share the love and e-mail a friend that might be interested, would you feel inclined to do so. Starting later this month, we'll be getting back to the 'regular broadcasting'. I will actually leave the office a lot more often, pick up the camera and have some long waited for and well deserved, fun sessions. 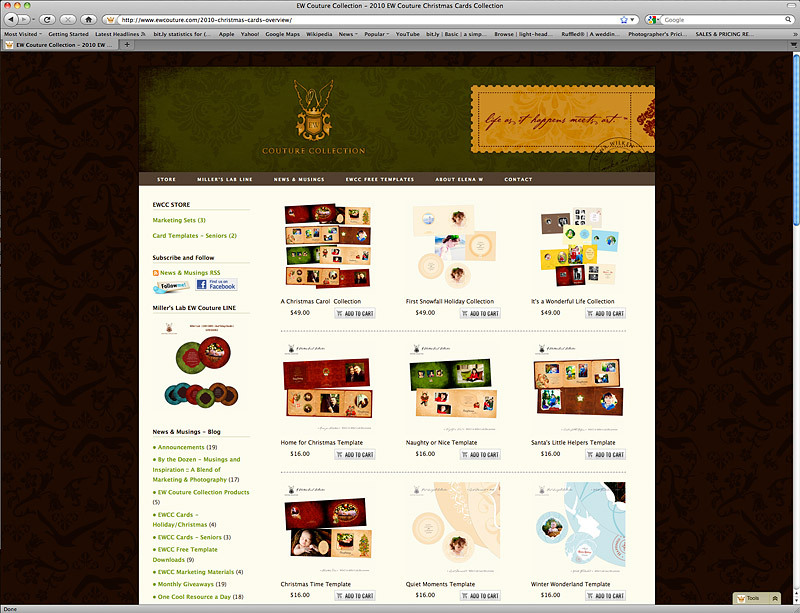 :) Between my full time graphic design position and this project, the sun has not kissed my face much. ... Here is a sneak peek to some of the stuff to come this evening. ... And all this would not be possible without you Paul, so thank you! I know it might sounds cheesy and cliche, but you have no idea how much I mean that.